Our guided sea kayak tours offer a unique Alaskan experience to independently spirited travelers who seek to escape the mass marketed shore excursions offered on board the cruise ship. Explore Ketchikan’s historic waterfront and the Tongass Narrows on the Pennock Paddling Adventure or experience true wilderness and seek out wildlife at remote Orcas Cove. Combine Orcas Cove with a flight seeing trip in a traditional float plane to the Misty Fiords for the ultimate shore trip. Full day trips and overnight trips will plunge you into the heart of the Misty Fjords National Monument. The Fjords, sometimes spelled Misty Fiords, offer pristine wilderness, abundant wildlife, plunging sheer granite cliffs, intimate waterways, waterfalls, hiking trails and crystal clear alpine lakes. Arrange a guided trip with us or use our outfitting services to rent a kayak and organize charter transportation for your own Alaskan sea kayaking adventure. “Sea kayaking is a unique way to experience Alaska’s wilderness. 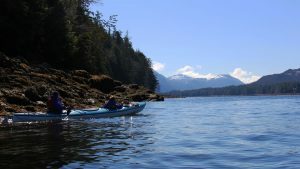 The protected waters of the Inside Passage and the sheltered fjords of the Misty Fjords National Monument provide exceptional opportunities for kayaking adventures in and around Ketchikan. Sea kayakers often find themselves paddling with seals, sealions, whales and eagles while the crystal clear water allows paddlers to view the colorful array of inter-tidal life just beneath surface. Guided tours with local kayaking companies allow visitors of all ages with no prior kayaking experience to enjoy their first kayaking adventures in safety. Overnight trips, unguided kayak rentals, local trip planning advice and charter boat transportation are also available in Ketchikan for those who seek to create their own Alaskan sea kayaking adventures”. – This article contributed by Southeast Sea Kayaks. – Jim Howard Published by The Globe Pequot Press. 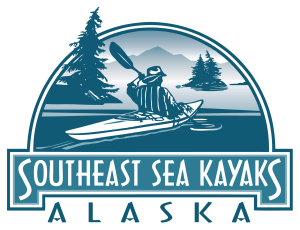 Email Southeast Sea Kayaks at: paddle@kayakketchikan.com or stop by and visit us just a short walk from the cruise ship docks.